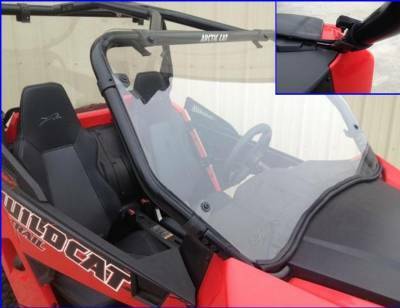 Arctic Cat Wildcat Trail/Sport Hard Coated Full Windshield Fits: 2014-16 Wildcat Trail (50” wide model)and 2015-16 Wildcat Sport DOES NOT FIT: Wildcat 1000 1/4” Thick Hard Coated Polycarbonate (hard coated on both sides). Attaches with “Patent Pending” Rubber Fast Straps Can be removed in 10 seconds. Rubber gasket protects and seals along the bottom. Made In Cleveland, Ohio. Made from thick 1/4” Hard Coated Polycarbonate, making it virtually unbreakable and scratch resistant. It can easily be removed in seconds without any tools. Simply unhook the “Patent Pending” rubber fast straps. We also offer polycarbonate rear dust stoppers.